This week’s image is from Lovers Key State Park. During the past week, Lovers Key hosted it’s first annual “Images of Nature Week.” They had a week long event with different photographers who came to the park to offer instruction on multiple photography topics. I was fortunate to be one of these photographers and hosted a two hour class on macro photography. I had a great group of participants, and we covered a lot of subject matter from photographing flowers to shells, and even some insects that were close by. It was a great time, and I had a lot of fun. 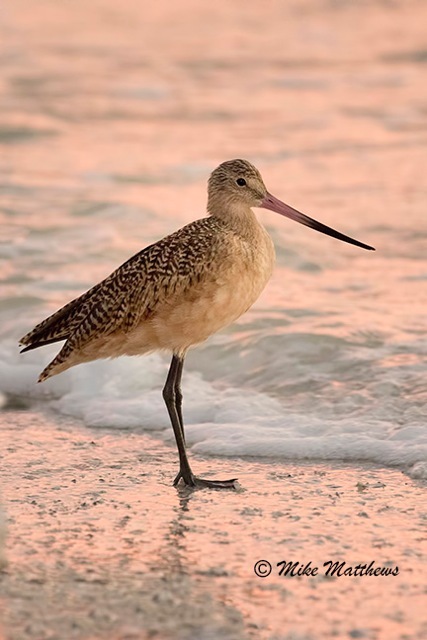 Afterwards, I took some time to photograph some birds along the beach with another photographer and we saw this beautiful bird called a Marbled Godwit. This was a first time sighting for me and the warm glow of the sun on the water made the perfect setting for the photograph. Lovers Key will be offering this event again next year with Clyde Butcher as the Keynote speaker.